I am an on-off Yogi. ☺ And even after knowing all the advantages of doing Yoga regularly, I've been a lazy bum! I realized that if I could start blogging about it, I would be faithful to doing it. :) But then again, I'm no professional to give you all advice about Yoga! What I would write (or re-write) will mostly be based on my search on Google. Hence, I have asked a good friend of mine, Irina Burlack who blogs at Quick-Reads to give me (us) a basic understanding of Yoga & its styles. Yoga has been around for a long while, in fact figurines of Yoga asanas (poses) have been discovered in Indus Valley that date all the way back to 3rd Millennium BC. And there are numerous reasons for this lengthy practice of Yoga. Some of the benefits that regular classes of Yoga offer are the increased strength, improvement of coordination, flexibility, better concentration and lowered blood pressure. According to recent research on WebMD, around 11 million Americans are currently taking the opportunity to practice Yoga and experience the health benefits from various Yoga styles. Yes, there are many styles of Yoga, meaning that everyone has an opportunity to practice Yoga in a way that fits their lifestyle. You may have heard the famous saying that “anyone can do Yoga” and that is 100% true, considering the range of styles that will create comfort for any mind, body and personality. Let’s take a closer look at some of the styles of Yoga. Ashtanga is one of the most well known of Yoga styles in athletic circles because of the demanding routine that works out each muscle in the body through repetitive flows and in-between jumps. Sri Krishna Pattabhi Jois discovered this yoga style; it is constructed to work on body and its function, while creating a more bulky muscles. Another recognized style of Yoga is Iyengar Yoga that was developed by Bellur Krishnamachar Sundararaja Iyengar, who created the atmosphere of detail-oriented Yoga class that encourages its students to go beyond into deep awareness of each muscle and its movement in the body. 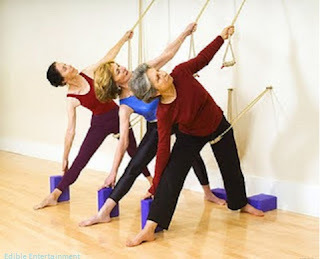 Iyengar Yoga classes are gentle and are great option for those, who are starting their Yoga journey. Iyengar Yoga teachers must go through rigorous 2 to 5 years of Training, which reflects in their profound knowledge of Yoga theory and practice. Vinyasa Flow Yoga is another style of Yoga I would like to introduce to you; to say the truth Vinyasa Flow is my most favorite practice of Yoga. This Flow Yoga style includes various components of Yoga styles and integrates them into a beautiful, graceful and dance-like continuous Flow. Vinyasa Flow Yoga not only includes the study of physical body but the gentle relaxation and meditation. This is a great class for dance and ballet fanatics; practicing Vinyasa Yoga creates a tranquil mind and lengthy muscles. This has been a short and sweet introduction to the beauty and basics of Yoga practice. I hope that this will encourage you to pursuit your own path to discovering Yoga and its benefits. So there you go.. Of course there are a lot of other new styles of Yoga each having their own plus & minus. But we'll get into that later. I did yoga briefly. Just few sessions and liked it, but could not continue due to timing issues. I am doing zumba now and loving it. Good to know so much about yoga.